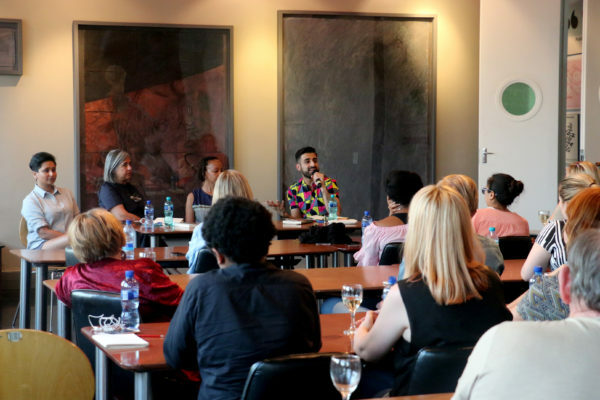 In a book discussion on Dawjee’s Sorry, Not Sorry, the author speaks of her experiences as a Muslim, gay, Indian and enlightened feminist in a white South Africa. Governing Intimacies Project in collaboration with WiSER hosted a book discussion on Haji Mohamed Dawjee’s thought provoking book of essays titled Sorry, Not Sorry: Experiences of a Brown woman in a white South Africa at the Richard Ward Building on Tuesday, August 18. Haji’s book explores the early life of Dawjee in a post-apartheid South Africa as a Muslim, gay, Indian-coloured and enlightened feminist, especially in a country which puts the needs of white South Africans above those of all other races. The book asks a number of ‘odd questions’, some of which are; why do South Africans of colour still have to deal with censorship and whether Islam really is anti-feminist as it is claimed? Keval Harie, director of Gay and Lesbian Memory in Action and a speaker at the event, told Wits Vuvuzela, “As someone who is of Indian decent, and had very similar experiences and anxieties around coming out with my family, I think the book was really powerful in the broader sense of queer identities. “Often, part of the challenge of being queer is your history and your heritage, which is one that’s silenced or there is a feeling of invisibility. What’s powerful about Haji’s book is that it gives a visibility and a voice to queer Muslim people,” Harie added. On the topic of classifying yourself as brown, as seen in the title, Dawjee was careful not to use the word ‘black’ to avoid appropriating struggles the race has experienced. “It’s not about segregation or othering. It’s just about learning not to appropriate black experiences because there is a militancy that is going on where we blanket every person of colour as black and then those people who aren’t African and black start appropriating those experiences and speak on behalf of someone else,” said the author. Given that the book further extends the conversations to religion and sexuality, this resonated with some people. Karabo Kgoleng, a seasoned radio broadcaster and speaker at the event gave a few critiques. She expressed that she hoped the book would explore more on the issue of racism between Indians and black people given that this is still a serious issue. The radio journalist emphasised, however, that Dawjee’s book is exceptional in that it affirms that as people of colour “we no longer need to ask for permission to tell our truth”, particularly in a white South Africa. Wits Vuvuzela:Book review: The Lost Boys of Bird Island. August 26, 2018. Wits Vuvuzela: New children’s book celebrates exceptional South African women. February 17, 2018.